I’m biased. There. I said it. I’m biased, in that I like the books I’ve written. I can’t help it. Frankly, I wouldn’t be able to get through the writing part of being a novelist without liking the books I write. Writing a book I didn’t like? Not gonna happen. 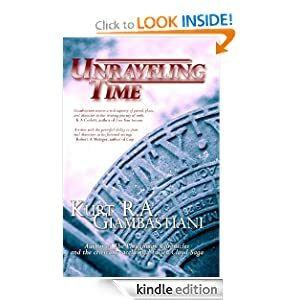 So, I’m biased, and that’s unfortunate, because it makes it impossible for me to understand why Unraveling Time didn’t sell. And I want to know. Seriously. I want to have an honest, open conversation about why this book didn’t sell. For the first time since it was published in 2006, I sat down and read Unraveling Time. It was an interesting experience, for several reasons. Though I remembered the plot (of course), I didn’t remember all the little twists and turns it took. Though I remembered the characters, I had forgotten all their little quirks and the massive arc they traveled through the story. And though I remembered writing the book (sort of), I simply did not recall most of the prose I read. It was like reading a book written by someone. And it was good. No, it wasn’t just good; at the risk of sounding egotistical, it was damned good. The writing style consistently separates the two POVs. The structure is strong, and clearly presents the rather twisted, convoluted timeline. The imagery is evocative and at times downright beautiful. The characters are believable. The backstories are full and interesting. The action is character-driven. The writing is tight and active throughout. The details of each setting are vivid but not overwrought. Sure, I understand that there are different tastes. I understand that one person’s “great read” is another person’s “snoozer.” I understand that. I also understand that genre fiction isn’t to everyone’s liking. So, what is “wrong” with this book? I mean it. If you’ve read the book (and it was free for a while, and a lot of people took advantage of the offer) and if you have an insight that I’m missing, sing out. I want to know. I may not change anything, but I want to understand. I don’t know the book industry at all, but I feel like I used to have a decent grasp of how the music buiness worked. It wasn’t a meritocracy, if you know what I mean. Quality, even at the best, wasn’t often rewarded. I’d guess you’re looking at the same thing with respect to your book. I think what we (or at least I) often confuse is what constitutes “merit.” Both publishing and the music industry aE businesses, and as such, they car less about artistic merit than they do about marketability. Now, the Venn diagram of art, with subsets of artistic and market merits absolutely shows some overlap–quite a bit, most likely–but in the end there is crap that is marketable and artistically valuable product that is not marketable. Bring on the inside of my own equation, I cannot discern which subset my work inhabits. Good but not marketable? Or crap _and_ not marketable? Either way, it seems sure that I am not in the marketable category. Either that, or I am simply not playing the game properly. The importance of “game playing” cannot be understated, I think. Traditional publishing, with its long-standing base centered in NYC, has a similar system of back channels and networked connections that cannot be understated. It’s changing to be sure, but in some ways the changes are causing the establishment to contract and close ranks. I wonder if the music industry had similar blow-back? Can it be as simple as people just don’t know about it? Actually, in wondering why “it didn’t sell” I was referring more to the pitches I made to agents, editors, and publishers, back in 2005-6. This year, when I promoted it for a free giveaway weekend, it was downloaded over 1100 times, so at least _those_ people knew about it. That translated into some sales and, considering how little effort I put into marketing, the results are not surprising. But why did no editors or agents find it of interest? That’s a different question. Ah, well that I can’t answer. I’m sure you already know the line about how many time Harry Potter was rejected… I guess sometimes the right agent just isn’t found, I guess. I have written things I didn’t like. But I was a Tech Writer for years and had to deal with the critiques of (personally very nice but) sometimes cruel managers. Aside from that, I do so now enjoy writing fiction and so I fully understand your comment. Now, as for this book which I’m currently reading (and loving it), I snagged a copy when you had it out for free not long ago. But I hadn’t started reading it for a while, until now. I should have known better than to wait. Why did I wait? I didn’t understand what it was about. In reading the beginning, I liked it. Then it got into home, hearth and relationships and I wasn’t sure where it was going. But I stuck with it. The writing is solid and the characters are quite alive and familiar to me for some reason and it kept moving me along. Though I found it somewhat hard to deal with at first as it’s a bit emotional and I’m a guy and all that narf and nonsense. But I wanted to know where it was going. So I stuck with it. Then all of a sudden it took a turn that left me floating in freespace and quite confused and then another turn and I was solidly planted way off in the wrong place. But I was liking it. Then ripped again into another and another and I just got to really liking it. Then it settled down a bit and let me get my bearings. By this point, I was not going to put the book down. Yes, you had infected me with “GV”, the nefarious “Giamabastiani Virus” that I had caught years ago with your “Fallen Cloud” series of books. One of the few diseases one truly loves to catch, by the way. So why isn’t it selling? I don’t know really. Your research is always meticulous and appreciated (again, see the “Fallen Cloud” series, no really) and your prose always a pleasure. I suspect people just don’t have a clear idea about what this book will do to you or maybe what it’s really all about. To say that it’s a time travel story doesn’t give one what I’m getting from it. This feels like much more. I should think it would be selling quite well but perhaps it’s one of those books where the right person has to tell the right people in the right venue. I know I’ve been telling everyone about it and I’m not even done with it. And I never do that. I need to get back to this book I’m reading…. I’ve blogged here often about old stories that I really liked when I wrote them, but which now make me cringe. That’s part of growing as a writer; we do our best each time, and each time our best (hopefully) becomes better and better. Frankly, I think your assessment may be correct: UT is simply a hard-to-pigeonhole book. Is it really time-travel? Not in the classic sense, no. Is it really a romance? Again, not in the classic sense. However, it is _exactly_ the story I wanted to tell, and that required history, time-travel, romance, and adventure all rolled up with a literary style. It does what it’s supposed to do, and does it well, so if it doesn’t catch fire with editors or agents or readers, I’ll just have to live with that.